The risk of lower urinary tract injury (bladder or ureters) at the time of benign gynecologic surgery is estimated to be between 0.3% and 4%. The majority are bladder injuries, with ureteral injuries occurring in 0.3%-1.8% of hysterectomies. While urologic procedures account for the majority of iatrogenic ureteral injuries, gynecologic surgery is the second leading cause, followed by general surgery and colorectal surgery. With respect to hysterectomy in particular, the risk of ureteral injury is less than 1%. In a large prospective cohort of women undergoing hysterectomy for benign indications in 53 hospitals in Finland, rates of ureteral injury varied based on the route of hysterectomy, with laparoscopic and abdominal routes having an injury rate of 0.3% and the vaginal route having an injury rate of 0.04% (Human Reprod. 2011;26:1741-51). The risk generally is higher with procedures for endometriosis, large fibroids, cancer, or pelvic organ prolapse. 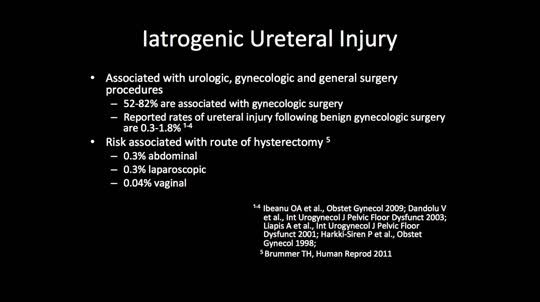 During hysterectomy and with gynecologic surgery overall, ureteral injuries occur most commonly at three locations: at the level of the infundibulopelvic ligament and ovarian vessels, at the level of the uterine artery, and near the vaginal cuff. Identification and knowledge of the course of the ureter at these three locations is essential in preventing ureteral injury during pelvic surgery. Perioperative ureteral stenting has been proposed as a method of preventing iatrogenic injury by allowing surgeons to more easily identify the ureters during surgery. Available reports suggest, however, that the actual risk of injury is not decreased and may even be increased by placing prophylactic ureteral stents, and most surgeons have moved away from this practice. The use of lighted ureteral stents during complex laparoscopic endometriosis resections may be helpful. Many health care systems recommend intraoperative cystoscopy with bladder and ureteral survey to evaluate the integrity of the lower urinary tract at the time of all hysterectomies. A recent study of nearly 3,000 women undergoing benign hysterectomies at the University of Michigan, Ann Arbor, showed a significant decrease in the rate of delayed diagnosis of urinary tract injuries with implementation of a universal cystoscopy policy. While the rate of lower urinary tract injury was fairly consistent before and after implementation of the policy (2.6% and 1.8%, respectively), the rate of delayed detection of a lower urinary tract injury decreased from 0.7% before the policy to 0.1% after implementation (Obstet Gynecol. 2016;127:369-75). The study also showed that hospital costs nearly doubled with a delayed detection of a lower urinary tract injury. Unfortunately, even a normal postoperative cystoscopy does not ensure there is no lower urinary tract injury, especially considering that thermal injuries resulting from the use of energy devices typically do not present until 7-14 days after surgery. Overall, however, ureteral injury detection rates with universal cystoscopy approach 97% (Obstet Gynecol. 2009;113:6-10).